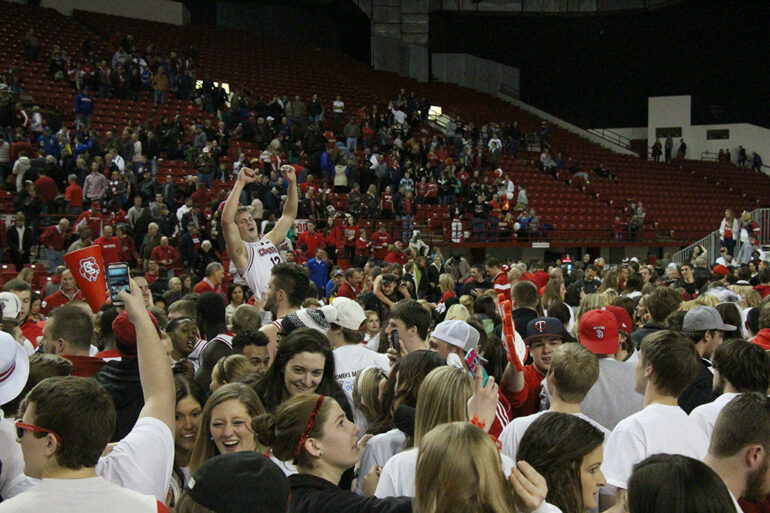 The USD men’s basketball team capped off its regular season with an 80-64 victory over rival South Dakota State Saturday in the DakotaDome. The win gives the Coyote men their first winning record in four years and also marks the first time the Coyotes have beaten the Jackrabbits in two years. Although the Coyotes won their game, they didn’t start the game the way they would have liked. SDSU was able to build a nine-point lead at the first media timeout — which was a flashback to a game earlier this year in Brookings, the team said. After that first media timeout, the Coyotes clawed their way back to tie the game up about halfway through the first half. A 12 to 3 run by USD at the end of the half gave the Coyotes the 44-34 lead at halftime. In the second half, SDSU was able to cut the lead down to 6 points, but Bos’ 3-pointer at the six minute mark ended a chance for the Jackrabbits to make a comeback. Despite a 16 point lead, Bos said a defensive effort made the difference in the game’s outcome. SDSU shot 46 percent from the field as a team and were held to 38 percent shooting against USD. The Coyotes said practices leading up to the game helped them prepare for the in-state rivals. It was also senior day for the Coyotes and the final home game for USD players Larson, Bos and James Hunter. Larson finished the game with 8 points and four rebounds. Bos added 12 points and had four assists, and Hunter contributed 8 points in the win. Although it was senior day, it was two juniors who led the way for USD. Guard Casey Kasperbauer finished with 17 points including 11 in the first half — which sparked the Coyote comeback. Fellow junior Tre Burnette led the Coyotes with 19 points and 13 rebounds in the win. For SDSU, senior forward Cody Larson led all scorers with 25 points and brought down 12 boards in the loss. Guard Jake Bittle added 12 points and first-year Reed Rellinghuisen scored 9. Both teams will have practice this week before they head to Sioux Falls for the Summit League Conference Tournament which begins the week of March 7. SDSU will be the top overall seed, and the Coyotes’ standing depends on the results of other games held today.